I’m back from market and I am BEAT. The car and trailer are still full of everything you see here and instead of unpacking I’m going to crawl into bed right this second. I just had to leave you with a couple of photos first…goodnight! I'm jealous! I love that zig zag quilt! The colors are awesome!! Your booth was lovely! Can't wait to hear more about market! It was so fun to meet you! Your boot hwas so pretty. I am excited to hear more about your market experience! Your booth is gorgeous. Love the colors. 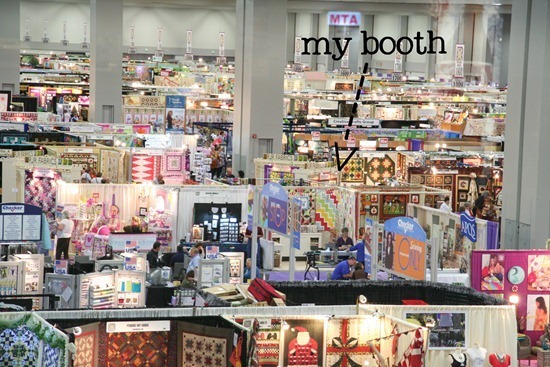 Sorry, I meant booth, lol…quilts on the brain. Your booth was awesome! I can't believe I literally ran over to you as soon as I saw your sign – I'm sure my mother died a thousand deaths.. :o) Loved meeting you and seeing your work in person! Allison, your booth was darling and so were you!! So fun to meet you! Your booth is so cute and makes you look like a pro at this. I hope you were crazy successful! what a fab booth. Enjoy your sleep. Cool booth! Isn't market overwhelming?! Sleep well – much deserved :) Love the overview picture of the booths. Over the past days I have seen lots of market pictures but not one that shows just how many booths there were. Wow! WOW your booth looks great! Your both looked amazing! :) and that shot of all the vendors??? I'm *swooning* over all that quilty and fabric goodness! Your booth looks fantastic! Look forward to hearing more details! That quilt in the corner always catches my eye (Sugar Dish? ), so happy colours and beautiful booth… I hope the market has been a great success story! Your booth looks like my kinda place. Enjoy your big sleep…..ZZZZZZ , I look forward to all the stories you have to tell when you awake. Your booth is so pretty Allison! I would have loved to be able to attend! Glad you are back!! Your booth looks fantastic! So sad that I missed it! Your booth was adorable! Your pics make me wish I could have been there. Your booth looks beautiful. Get some rest and we can't wait to hear all about your adventure! Your booth looked great. Get well rested. We want to hear everything! Your booth looks fabulous and so did you (in the pictures that have been floating around!). Congrats on what sounds like a successful market! That is a SUPER CUTE booth! Great job Allison! Your booth is lovely! I would have loved to see it in person. Wow! Where was this at? I'd love to find something like that around here. Your booth looks lovely. Hope you had a wonderful time! oh my gosh, Market looks massive and completely overwhelming. hope you had a productive and great time! Thanks for taking your last piece of energy and giving it to us! 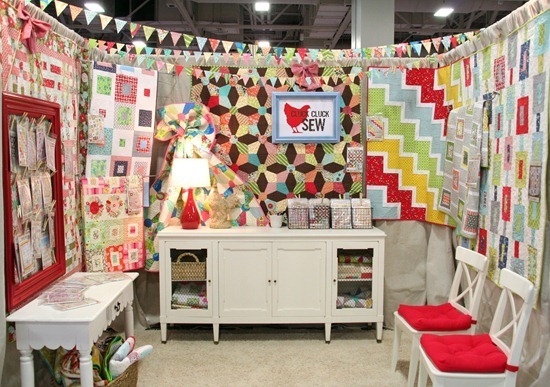 Your booth looks so inviting, love all your quilts and colors! creative people and seeing all the new fabrics. So fun! What excitement to have your own booth! Looks just like what you sew! Can't even imagine taking all of that in…what fun. Oh, if I lived up in that Salt Lake area again – – I'd be there in a heartbeat! All those wonderful quilts and booths! But my favorite thing would be to meet you and Camille – just love both of your quilts, designs, and blogs! I think that must be what heaven looks like! lol! I hope you got some rest and that you have a blessed week! Your booth looks fabulous!!! I cannot wait to hear more about. Hope you get some good naps today! Your booth was perfect, and the only thing this picture is missing is you! Welcome home. We appreciated all that you did. I know it was worth all the work – lovely time, lovely booth, lovely friends! Your booth was cute! I wish I could have been there to see all of it, I bet it was awesome! not only am i bummed about missing spring market – i'm totally bummed about not meeting yoou. i hope you were super duper successful my friend. your booth looked awesome! good for you for going and taking the market plunge. being a huge chicken myself, I'm soooooo impressed!!! Good Googly Moogly! Probably a good thing I can't go – I'd never get past the first booth, I'd just stand there with my mouth gaping open. You have a lovely booth – all vibrant and colorful. Hope you got lots & lots of orders in!! thanks for sharing it with us! Allison, your booth looks awesome. Hope you enjoyed yourself. It was so nice to meet you! Your booth was beautiful and one I will not soon forget. Such a great booth…and it was so nice to meet you! Allison your booth looked awesome. Can't wait to hear more about the market on your blog. Would love to visit this market one day, it puts our quilt markets in the small category. What eye candy that is! Can't wait to hear every detail. Your booth can be unpacked later! You may not remember me but that's okay. It was fun meeting you! I love your blog and your quilts are amazing. P.S. I was hanging out with Sherri from "A Quilting Life" just to help you remember. Your booth was awesome too! I loved it! I hope you recover soon so you can show us more and tell us how fabulous you were. LOVE the booth. GORGEOUS with all those wonderful colors. so awesome!! sweet booth! Just busted out your kaleidescope quilt pattern today- LOOVE IT!!! Can't wait to hear more about your Market exp! So excited for you – hope you catch up on sleep quickly and hope it was a HUGE success!! Soooo exciting! Your booth looks great! Very glad to hear you had such a nice time. Can't wait to hear more when you are all rested up. your booth looked amazing- can i ask where you got your white buffet table??? Where was this booth at, a fabric market? It looked adorable.I am a quilter too.. fun colors.